Most of us had a bike as kids, usually a Huffy or Schwinn bedecked with the popular accoutrements of the era (ranging from tassels on the handlebars, to baseball cards in the wheel spokes, all the way up to full-on “battle gear” from the likes of He-Man or She-Ra.) For a lot of us, we probably still think of bikes in much the same way as we did back then: a fun way to get around, with the additional benefits as adults of both exercise and the avoidance of traffic. Over the last 20 years or so, however, bikes have taken on a new and significant role in the world of law enforcement, bringing a whole new suite of capabilities to our daily work while also reconnecting some of the old capabilities we had before the era of the patrol car. Today I’d like to highlight some of those benefits, and talk about some creative ways to integrate and gain from bike patrol in your own agency. One of the first casualties of the shift towards vehicle-based policing, and in later years, budget cuts, was the loss of the foot patrol. Speed came to be the priority when looking at how we go about patrol work, in the sense that faster is now better in many minds (look no further than the all-important response-time metric by which many agencies are now judged for proof), and “slowness” has now become the enemy. Unfortunately, one thing which was lumped into that drive for efficiency was also a reduction in the perceived value of deliberate action, as we came to prioritize the high intensity of Bruce Lee over the strong foundational work of Tai Chi without realizing that Lee would never have been able to fire off that flurry of moves without building up to it first over a long period of practice. The same is true of police work: sure, we can rapidly execute time and again on calls, banging them out one after another, but it’s only by slowing down and reconnecting to the fundamentals of the job that we become the most effective. That’s really where one of the primary benefits of officers on bikes comes in: it blends some of the speed which society now demands with the deliberation and connectedness that help to build a strong foundation with the community by giving us the time to truly observe what’s going on around us. But there’s a lot more to it than just that. 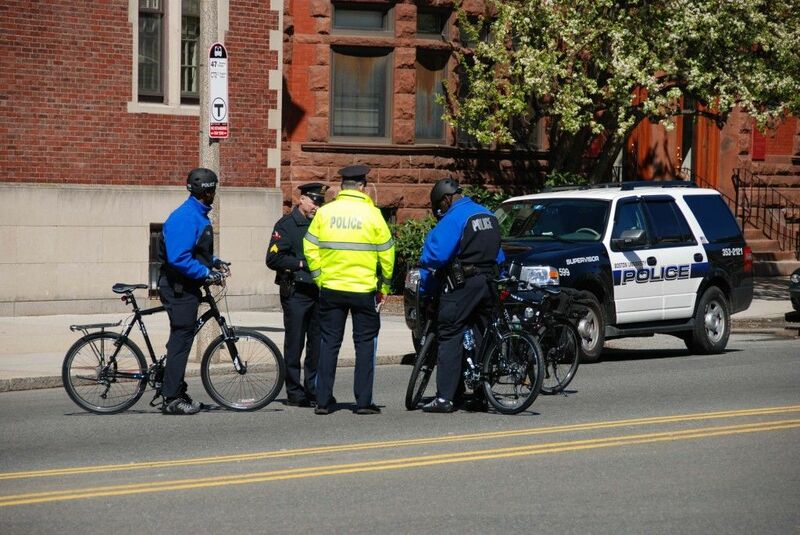 There are a wide variety of scenarios which bike patrol can be effectively applied to. Let’s start with the most basic: everyday patrol. The results of a study conducted by Roger Williams University a few years back found that a couple of the perceived benefits of having patrolling officers on bikes were, in fact, true in reality — namely, increased contact with the public (the study found that it more than doubled when an officer was on a bike), and an enhanced ability to provide field observation without detection (from the tactical-benefits standpoint). On the latter point, one of the best ways to impact higher-crime areas may be to put out officers on bikes to provide higher visibility and presence while also still giving the officer a fairly quick means of egress if needed for their own safety. That’s not true only for those areas, of course – the same thinking can be applied to deployments in urban centers, shopping areas, school districts, and much more. By having those officers out and promoting increased positive contact by making them more approachable (it’s a lot easier to stop and talk to someone on a bike than in a car), new avenues of information are opened up from those who live and work in those areas every day, and who have the most objective observations available as a result – we all know that people’s attitudes change as soon as they see us, so having info from when we’re not around can be even more important than that which we gather in person. To continue the metaphor of martial arts, however, we can also gain direct access to those objective observations by operating in stealth (or ninja mode, if you will) while out on bikes. Think about the last time you did a traffic stop in your patrol car. Chances are, you were mainly focused on the occupants of the vehicle – but who was watching you, other than them? It’s pretty well established that drug dealers, for example, use spotters to warn them when we’re coming, but the opposite hasn’t traditionally been true, leaving us at a slight tactical disadvantage. Now picture having one or two officers on bikes hiding in the shadows as you did that stop – or made any other suspect contact — different ballgame, right? The same strategy is even used by bike officers themselves making traffic stops, where the New York State Police utilize a four-officer configuration, with two serving as overwatch for safety. By having the ability to move quickly, without detection (nobody expects the Inquisition, as the saying goes, meaning that offenders have also been conditioned to look for a lightbar when watching for us, and may not take a second glance at a bicyclist), we gain the ability to have multiple eyes, from multiple different points of view, unobtrusively observing an activity, meaning that there’s a better chance we’ll see the reality of what’s actually going on, as opposed to the reality we’re presented with once someone realizes we’re there. There are other times, however, such as during organized protests or large events, where the opposite is true, and we want to be not only noticed, but perceived to be in greater force than we actually are. Bikes are a terrific resource for these types of scenarios, for a lot of different reasons. First, officers can deploy and redeploy rapidly to counter evolving threats or shifts in movement (really easy to coordinate now that protest groups are Tweeting our positions at each other), resulting in a perception of “man, they’re everywhere” on the part of the crowds we’re trying to control as well as the real ability to actually contain or disperse. Additionally, even having those officers out there on a regular basis means that the capability to respond to those incidents is always there and ready to go, even if they’re not known about beforehand – giving us the chance to be seen quickly, before things get ramped up and out of control. Second, having a group of bike officers gathered together in a phalanx or other formation can serve a similar purpose as mounted units have in the past, in the sense of providing a perception of physical force to deter resistance on the part of offenders. The bike itself can be used to create a barrier once that phalanx stops, through placing one bike behind or in front of another at the wheels while turned sideways, further enhancing that effect and providing a standoff to help protect the officer. Finally, believe it or not, chances are that even being an officer out on a bike, as opposed to a patrol vehicle, might in fact reduce the hostility of a crowd or the disruptiveness of a gathering – because most citizens, just like we talked about at the beginning of the article, tend to perceive bikes within the confines of the memory of their own childhood two-wheeler, and as a result tend to see it as much less threatening than, say, an armored vehicle. Obviously, there are many more situations in which your agency can utilize bike officers, and we’re really just scratching the surface of what’s generally possible. The fact of the matter is, however, that it’s entirely possible to deploy a professional-looking, functionally- and comfortably-equipped police force on two wheels, and have them serve not only the role of community policing, which is probably what many of you associate with the concept, but also to augment, and serve as a force multiplier for, the core missions which we undertake every day to protect and serve our public to the best of our ability.